A new book says President Obama complained about former President Clinton's "bald-faced lies" during Obama's campaign against Hillary Clinton. The flood of books devoted to the 2008 campaign and President Obama begins in earnest this week with the release of “Renegade, The Making Of A President,” by former Newsweek reporter Richard Wolffe. Wolffe’s account of the Obama campaign isn’t to be officially released until Tuesday, but POLITICO obtained a copy earlier this week. Before the election had been called, but when it looked promising for Obama the then-candidate called his top adviser, David Axelrod. “What’s going on?” Obama asked. “Look, I’m not going to say congratulations yet, but boy, it looks awfully good,” Axelrod replied. The impressive fundraising Obama demonstrated in 2007 was largely a result of the usual high-dollar contributors – not the small-dollar donors the campaign liked to hold up to the press. “It wasn’t the internet,” admitted Penny Pritzker, Obama’s national finance chair. The revamped stump speech Obama gave to Iowa Democrats at their Jefferson-Jackson Dinner in November of 2007 was borne out of a speech Obama scribe Jon Favreau had written for the candidate earlier that month in South Carolina. Favreau trimmed the original version and sent it to Obama who had to memorize it for what became a pivotal moment leading up to the Iowa caucuses. Aides were concerned that Obama was not prepared to give the speech, but he largely got it right on his first run-through a day before the dinner. The morning after Obama lost the early-March Ohio and Texas primaries, campaign manager David Plouffe suffered through an uncomfortable car ride with the candidate and his wife, Michelle Obama. After Obama gave his race speech in Philadelphia primary but before his former pastor, the Rev. Jeremiah Wright, would make his now-infamous appearance at the National Press Club, the candidate went to Chicago to meet with Wright. Obama was trying to dissuade Wright from a “comeback tour” and told his former pastor to expect a “media circus” if he reemerged. His wife is now Obama’s Secretary of State, but Obama had some tough words for the actions of former President Bill Clinton during the campaign. Later, when considering who to name as his running mate, Obama told aides that if Hillary Clinton would help politically she ought to be considered. 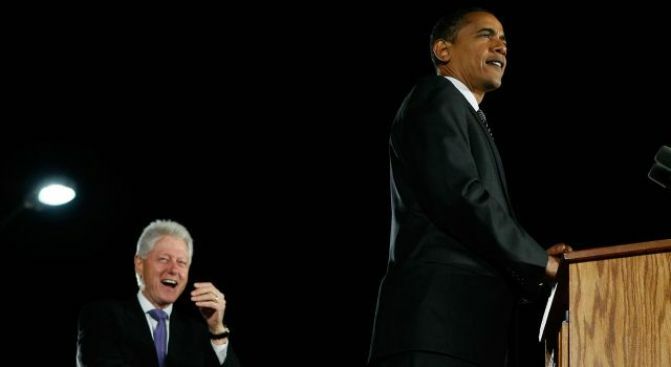 “But I’m concerned about Bill Clinton being a loose cannon,” Obama said, according to Wolffe. When Sen. John McCain wouldn’t return the phone calls of Sen. Joe Biden, the never-subtle Delawarean sought out his longtime colleague. In New York City with Obama and McCain where the two were both appearing at a public service event on the anniversary of 9/11, Biden was rebuffed by McCain’s aides backstage when he asked to see the GOP nominee. So, Wolffe writes, Biden went to McCain’s green room door and knocked. After Obama locked up the nomination, Pennsylvania Gov. and ardent Clinton supporter Ed Rendell got a note from an Obama supporter attached to a can of Kool-Aid telling him to drink up. So the next day at a Philadephla fundraiser for the Pennsylvania Democratic Party, the ever-demonstrative governor poured it into a glass of water and proclaimed: "Now I feel that Senator Obama is the most wonderful person ever to have lived in the United States of America. The smartest, most sensitive most decent and honorable man. Now I understand what you guys have been feeling for the last six months."